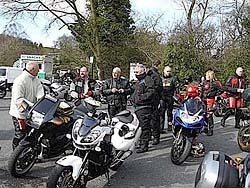 Went on a ride out up to Hartside Cafe today with NUKB led by Muddyxr. The Viffer performed really well and my riding has improved so much more. It really helps following experienced riders, helps educate you about the correct lines to take. I would recommended to any new riders finding a similar type of site and get yourself out there. Started out from Tickled Trout in Preston and quickly made our way to Devil's, the Police where in attendance offering free cups of tea. (You were forced to have your bike inspected for the pleasure though). 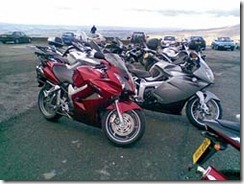 From there we made our way up to Hartside Cafe. Its the highest cafe in England and is up a very twisty little section. 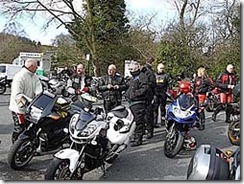 Then from there back down to Devil's through Alston and Middleton-in-Tessdale, there are some great roads up in them dales.